Bijou Doucet, a survivor of the earthquake in Haiti in 2010, has just moved in with her aunt and uncle in Brooklyn, where she attends an all-girls school. 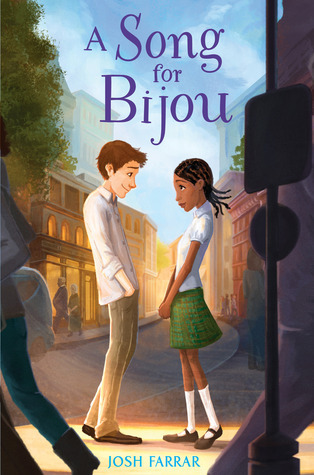 Though Bijou is not permitted to date or even to socialize out of school, she manages to attract the attention of Alex Schrader, one of the students at the nearby all-boys school. Alex is pretty clueless about girls, but he is sweet, and before long, Bijou, too, wants to spend time with him, even if it is forbidden. Through their sweet and innocent first romance, Alex and Bijou overcome the pain of Bijou's past, the restrictive rules of her aunt and uncle, and the intolerance of their classmates. I was drawn to this book on NetGalley for two superficial reasons: the poetic sounding title, and the cover illustration by Erin McGuire. I guessed instantly based on those two things that this would be a cute middle grade romance. What I didn't guess - and what truly makes this book special - is how many other story lines figure into that romance. This isn't just a love story, but a story about cultural differences, empathy, acceptance, and forgiveness. Because the narrative alternates between Bijou's voice and Alex's voice, the story is well-balanced and presents the challenges of both characters. Even when the characters misunderstand each other and fail to communicate, the reader remains sympathetic to both sides of the story and continues to root for the success of their relationship. In addition to the well-realized main characters, this book is also populated by many wonderful supporting characters. Alex has two best friends, the actions of whom figure heavily into some of the mistakes he makes in trying to get to know Bijou. Bijou has an older brother who has moved out of his aunt and uncle's house and who teaches Alex to play Haitian rada music and conspires with Bijou to find ways for her to spend time with Alex. Alex and Bijou each also have a set of class bullies who tease them about their relationship and use cyber-bullying to intimidate them. The entire world of this story feels very contemporary, and I could imagine these same situations playing out in the schools in my neighborhood. This is a great book for readers who enjoyed Same Sun Here. Both books alternate between a boy's point of view and a girl's, and both deal with characters who expand their horizons by learning about each other's cultures. It is also a very boy-friendly romance. Though Bijou is a significant part of the story, most of the romance comes through in Alex's narration. I'm not 100% sure the cover will attract male readers, but Alex's voice is so authentic, middle school boys - especially those who are already fond of reading - would easily get hooked once they started reading. A Song for Bijou is a beautifully written story of first love, and so much more. Issues of racism, bullying, and cultural differences make it a great read-aloud or book club choice for middle school students who love to discuss and debate serious issues. I look forward to reading more from Josh Farrar, and I plan to read his other middle grade novel, Rules to Rock By, which was published in 2010.